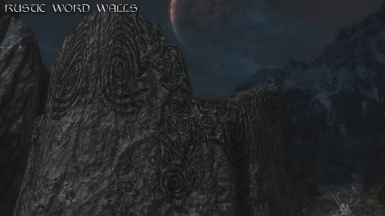 This mod retextures the dragonshout walls located above and below ground, though most commonly on Skyrim's mountains where they are guarded by dragons. 2K and 1K versions available. Do not use this textures without my permission. 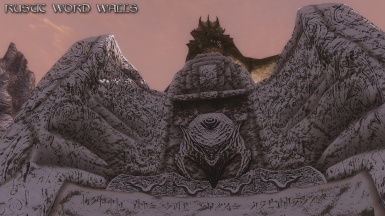 32cm for allowing me to modify his Tamriel Reloaded - Mountains and Rocks textures. Bethesda for allowing mod authors to modify their game, and for providing the tools to dos so. 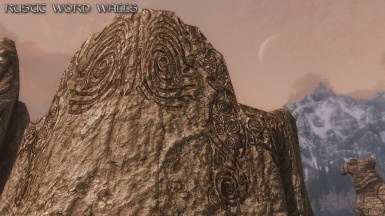 Nexus for providing a great showcase and community for mod authors to share their work. CG Textures for their invaluable photographic resource. 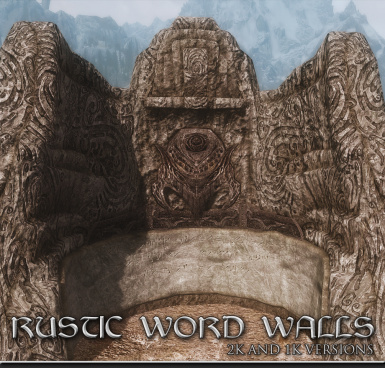 RUSTIC WORD WALLS is a retexture of the dragonshout walls located above and below ground, though most commonly on Skyrim's mountains where they are guarded by dragons. 2K and 1K versions available. 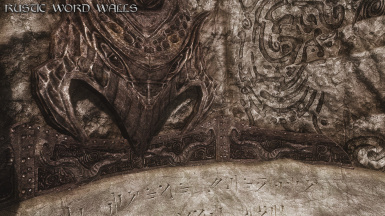 The Word Walls are interesting structures, with an amphitheater stage design that is covered in scroll engravings and metal dragon designs. Unfortunately, the carvings look more like vinyl decals applied on top of the surface, rather than designs carved into the stone. 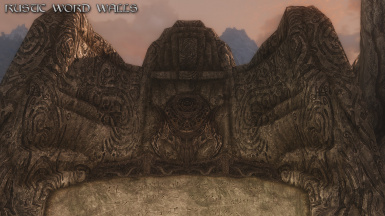 Like many of the objects in Skyrim, the design concept was good, but the execution left something to be desired. 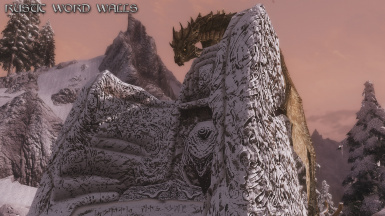 Now, this may not have been that obvious to many people, since many of the Word Walls are located in dark dungeons, or on snow covered mountaintops. In the later case, the ugly nature of the scroll carvings was disguised by the even uglier nature of the terrible painted on snow effect. Gotta hand it to Bethesda for such creative problem solving. 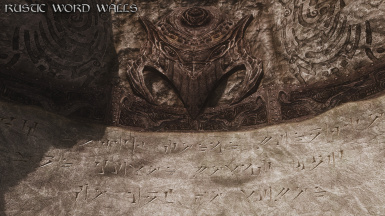 My aim was to enhance the detail of the Word Walls (both the stone and metalwork), while improving the scroll design application to make it appear as if it was actually carved into the stone. I think that I managed to achieve that effect. 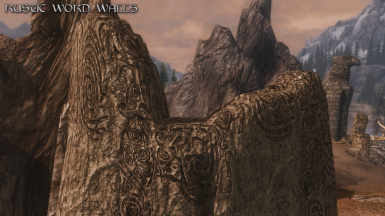 Since the Word Walls share textures with other objects in the game (much like my RUSTIC STANDING STONES mod), I tried to stay close to the original look of the textures. I didn't want to create mismatches in dungeons, since that's where these textures come from. 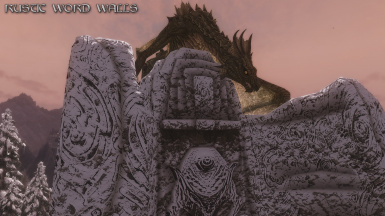 A special thanks to 32cm for allowing me to adapt his Tamriel Reloaded Mountains textures (loads of great details in them). 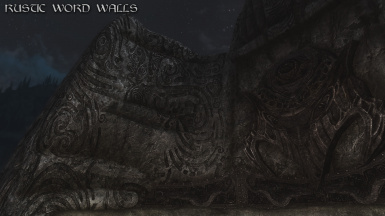 There are 6 sets of textures that make up the Word Walls, all of which are found in the "dungeons" folder, with 2 of the sets in the interior "nordic" folder (the metalwork). This mod is just a simple texture replacer, so there are no meshes or ESPs to be concerned with. If there are any "conflicts" with other mods, just install my textures after them. As with all my mods, I like to give options, since people's setups are very different. Therefore, I have a 2K version, a 2K diffuse with 1K normal maps version, and a 1K version. Choose whichever is appropriate for your computer. 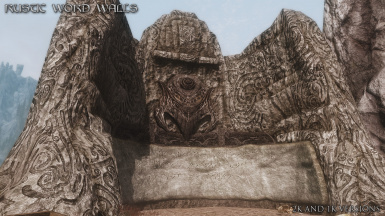 Personally, since the Word Walls are large objects in game, I'd suggest you use a version with 2K diffuse textures if possible. 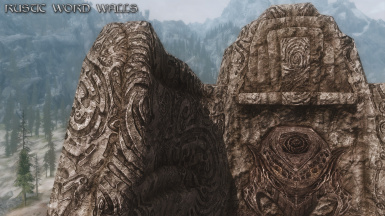 And there you have it... another small addition to my "Rustic" series of retextures for Skyrim. I hope people enjoy it.